Real Ale in the UK has, since the early 70s, been championed by CAMRA which has helped the industry to grow and has resulted in an ever increasing number of successful, independent breweries across the country. There has been significant growth in real ale production and consumption throughout the UK. This is clearly reflected in some of our less mainstream events where we often see as much as 70% of the draught sales coming straight from the cask. The Really Good Bar Co bring a Real Ale selection to all our festivals ranging from a small 2 cask stillage on the back bar to racking and refrigeration for up to 100 casks for a full "Beer Festival Tent". We source all the beers direct from the local breweries and can bring in refridgerated artics to ensure perfect ale storage at your event. 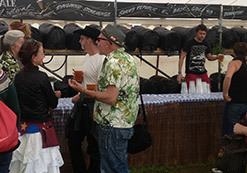 Each year The Really Good Bar Co visits breweries, attends events and tastes many ales as part of our selection process for the summer festival season. At End of the Road Festival we run a local real ale festival with over 50 varieties, from light summer ales to bitters and stouts all of which are produced within 30 miles of the event's Dorset location. 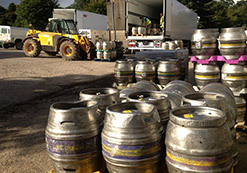 We have, over the years, also sourced several event-specific real ales. During this process we work with our brewery partners to create a real ale of a suitable style, taste and abv. These ales are always very popular with the customers. In 2014 we also started championing vegan ales, this started with stouts but has now expanded to include a wide selection of cloudy ales.